Bravo just keeps trotting out new stuff: tonight, it's the latest season of the fun Celebrity Poker Showdown, featuring Omorosa, Andrew Firestone and other reality rejects, a group who Bravo seems to have such a fascination with these days. If poker isn't your bag, maybe fun bags are: Comedy Central is also repeating its Roast of Pamela Anderson. CBS neckties are putting the future of their evening newscast in the hands of interns. A summer-long project broke up CBS News’ nearly 100 interns into small groups to strategize on how to attract younger viewers to CBS Evening News. A spokeswoman called it "an educational exercise" for the students. Yeah, right. 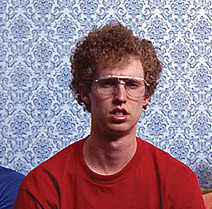 I think CBS News would install that dude from Napolean Dynamite as anchor if it'd win them more 18-49's. Does Fox News Channel, the so-called right-wing cable news network, affected how people vote? A new survey found that there was no detectable "Fox Effect" on which party people voted for, or whether they voted at all. It also suggests viewers possess the ability to "filter" biased new reports, all by themselves. Desperate Housewives hottie Eva Longoria was bumped on the head by a pole Wednesday during taping of ABC's megahit. She was taken to a nearby hospital where she was treated and released, a spokesperson for the show said. Longoria is expected to return to work on schedule, with an undented head and her pretty little face intact. In yet another short-sighted deal by a major sports league, the NHL cut ties with ESPN and sold its rights to Outdoor Life Network. OLN, which recently made the bold acquisition of Surivor repeats, is in 20 million fewer homes than ESPN, which is considered (for better or worse) as the premier cable sports destination. OLN will carry games on Mondays and Tuesdays and will pay $65 million this season and $70 million in 2006-07, with options for four more seasons after that. ESPN declined to match the offer. George Bodenheimer, the president of ESPN and ABC Sports, said "given the prolonged work stoppage and the league's TV ratings history, no financial model even remotely supports the contract terms offered."